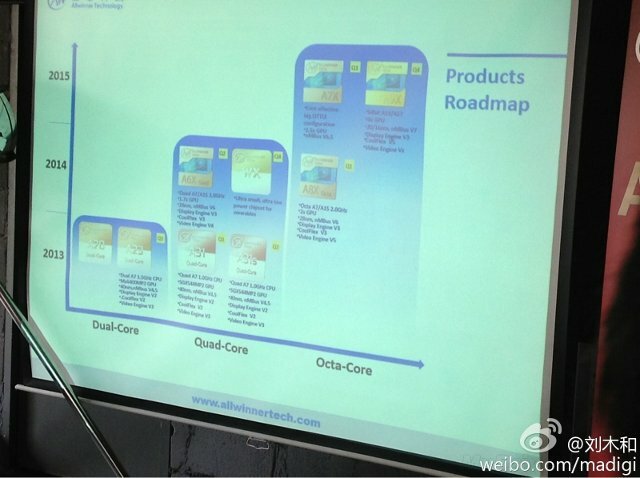 AllWinner has recently unveiled their products roadmap until 2015. They’ve got big.LITTLE cortex A7/A15 processors, as well as a processor for wearable planned for 2014, and a big.LITTLE Cortex A53/A57 processor, as well as another Octa-core bit.LITTLE processor (cores unknown) for 2015. There’s also a new processor for 2013, called A23, which is a cost down version of Allwinner A20 dual core Cortex A7. Let’s have a look at the different upcoming processors. AllWinner A6X – Quad-core cortex A7/A15 (big.LITTLE) @ 2.0GHz with a GPU offering 1.7x more performance (compared to SGX544MP2 in A31?). Planned for Q2 2014. AllWinner WX – Quad-core processor for wearable devices (e.g. smartwatches). Q4 2014. AllWinner A8X (A80) – Octa-core cortex A7/A15 @ 2.0GHz with a GPU offering 2x more performance. Planned for Q1 2014. AllWinner A7X (A70) – “Cost effective big.LITTLE configuration” octa-core processor with GPU providing 2.5x more performance. Not sure it’s A7/A15, or A7/A12, or A53/A57 at this time. Planned for Q1 2015. AllWinner A9X – Octa-core processor with A53/A57 cores (64-bit) with a GPU delivering 4x more performance than SGX544MP2 found in A31. It will be manufactured using 16 or 20nm process technology and become available in Q4 2015. In the short term, that means we could get low cost big.LITTLE octa-core products based on AllWinner A80 very soon (Q1 or Q2 2014) . Details are currently lacking for all these new processors, except AllWinner A23. The company provides Android 4.2.2 SDK for the processor. As mentioned above, this is a low cost version of AllWinner A20, and they’ve removed Ethernet and SATA support, and limited resolution to 1280×800, which means it’s really targeted for tablets. However they’ve boosted the frequency to 1.5Ghz vs 1.0Ghz, probably thanks to a different manufacturing process (40nm vs 55nm). Power consumption has also been improved with 50 mA consumed during audio playback, and just 2.6mA in standby mode. I can also see OpenMAX support for video playback, which may make it easier for software development, as it may use a standard API instead of CedarX proprietary API (TBC). A23 based Tablets will be available later this month, but some Chinese websites got their hands on prototypes (8″ tablets with 1024*768 resolution), and got 12500 points in Antutu 4.0.3. See 1pad.cn and imp3.net (both in Chinese) for details about the tablets. From the 1.7x and 2.0x multipliers I’d guess we will see the new Mali GPUs on these SoCs. With the rising requirement for 64-bit application processors, Allwinner Technology today is announcing that its first 64-bit tablet processor should hit the market by end of 2014. A 64-bit development board should also be ready for demo during the Hong Kong Electronics Fair in October. As a leader in application processor design, Allwinner is always dedicated to providing high performance SoC solutions with low power drain to mobile electronics. Allwinner’s first 64-bit tablet processor, with its support for 4K video codec, H.265, and leading fabrication process, aims to provide a highly cost-effective tablet solution to ODM/OEM partners and end users worldwide. As a member of Linaro organization, the Linaro builds of the AOSP for 64-bit ARMv8-A platform “Juno” and will be a key building block to enable Allwinner to offer a range of differentiated solutions across multiple markets.